Colder days are coming. This is not a reason to stay at home. I am happy to offer a range of autumn/winter berets. They are made especially for delicate, sensitive head. Cotton lining provides comfort and allows skin to breathe. 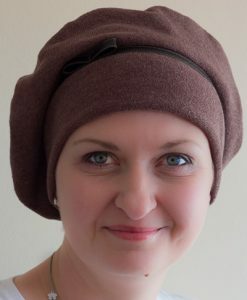 Choice of thin or thick cotton or wool gives perfect head cover and nice, pleasure warmth to your head. At top of this, our berets look absolutely fantastic. They very glamorous and fashionable. They look really fancy both on bold and on a hairy head.